Wet sandy shores of Lake Superior and inland lakes; pools in rock crevices of Isle Royale and the Pictured Rocks; in acidic, sterile soils. 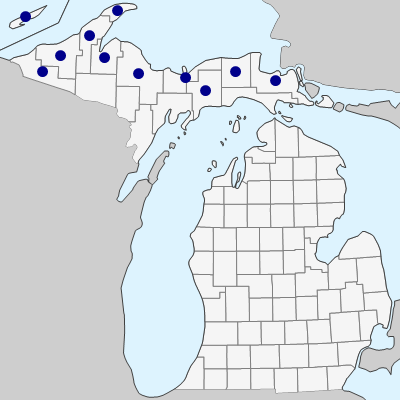 The Kent Co. collection mapped in Michigan Flora (E. J. Cole in 1897) is an immature specimen of C. emoryi and the Oakland Co. record (meadow at Marl Lake, O. A. Farwell 4933, BLH) is correctly determined, but surely mislabeled, given the completely inappropriate habitat and geography, and therefore not mapped. MICHIGAN FLORA ONLINE. A. A. Reznicek, E. G. Voss, & B. S. Walters. February 2011. University of Michigan. Web. April 19, 2019. https://michiganflora.net/species.aspx?id=994.